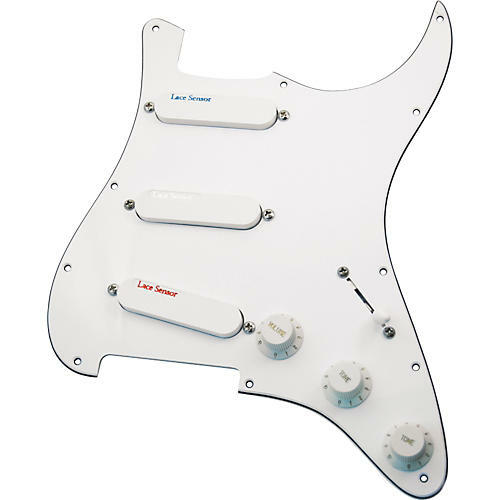 This prewired electric guitar pickguard contains Lace Sensor Blue, Silver and Red pickups. The Lace Sensor pickup has been in production since 1985. Used exclusively by Fender until 1996, the Lace pickups prewired into this pickguard have the same specifications and the same great tone. Lace Sensor-Silver Guitar Pickup: A fat 70's single-coil sound with increased output and more midrange. Lace Sensor-Red Guitar Pickup: The hottest output of our Sensor Series. Perfect for the bridge position when fat, punchy humbucking output is required. Lace includes a warranty card and other useful information regarding Lace Music Products.